Bespoke Ground Source Heating Solution, designed and installed by experts to meet your full individual heating and hot water demand. 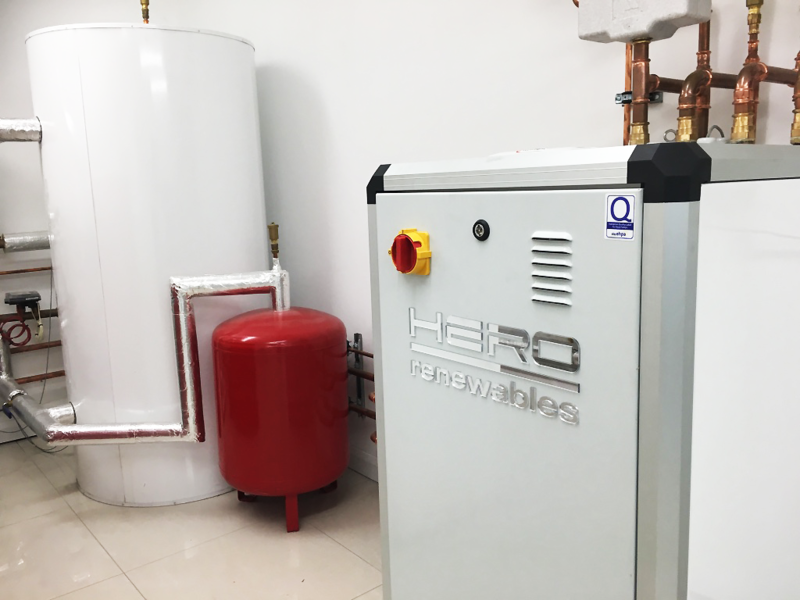 Hero Renewables have successfully completed hundreds of Aquamaster installations up and down the UK for a range of different customers, from new build projects, to large district heating schemes. We have to to this day received zero complaints across all of our eleven governing bodies, which means Hero is a name you can trust. Let us tell you why the Hero Aquamaster is the perfect fit for your project. To Request a quote for your Hero Aquamaster, Contact Us Today. With remote monitoring included as standard on all of our Aquamaster units, keeping your home at the perfect temperature has never been easier. Control your heating using a mobile phone or tablet from anywhere in the world, and receive alerts if there is ever a problem with your system. With the addition of remote monitoring comes an industry leading 7-year product warranty, this also means that if there is ever an issue with your heat pump, a Hero Engineer may even know about the problem before you do. The 7 year warranty also covers the entire RHI period which means your investment is as secure as possible. The biggest innovation to come to heat pumps since they were first introduced to the market, inverter driven compressors have the ability to modulate the output of the heat pump to match the demand required by the property. This has the potential to reduce running costs up to 25% and extend the total lifespan of the system. The Hero Aquamaster has the capability of connecting up to 6 heating circuits, including swimming pools, solar thermal panels and your hot water supply. This flexibility means that whatever your circumstance, be it connecting underfloor heating with oversized radiators, or varying temperatures across different zones, the Aquamaster will have the right solution. All heat pumps have the ability to provide passive and active cooling, although to receive Renewable Heat Incentive payments you are only allowed to design the heat pump for passive cooling. Ground Source Heat Pumps have very little moving parts other than the internal compressor, therefore, noise output is very similar to that of a kitchen fridge. A Ground Source unit will typically sit in an internal plant room along with the hot water cylinder that is connected to piping laid external to your property. There is no project too big or small for our design engineers, we are able to cascade Aquamaster units to deliver up to 2 Megawatts of heat demand which is ideal for commercial applications.